Baby Milk Action and IBFAN are publicly repeating their call for Nestlé to modify its new BabyNes 'nutrition system' to follow the joint FAO/WHO Guidelines for the safe preparation, storage and handling of powdered infant formula (WHO PIF Guidelines) (note 1). The machine prepares an instant bottle of infant formula using a capsule containing powder, which is not sterile and may contain harmful bacteria. The WHO PIF Guidelines include a step to kill such bacteria. Nestlé also claims to add bacteria to the formula, using this as the basis for unproven health claims in its marketing. It refuses to introduce the step that kills bacteria or to warn on labels that powdered formula is not sterile. Photo caption: Laboratory analysis of capsules of baby milk for BabyNes machines detected the presence of bacteria, proving that the milk powder in the capsules is not sterile, as shown in the photo. The WHO PIF Guidelines providing step-by-step instructions were introduced in 2007 and include decontamination step to kill harmful bacteria that might be present in the milk powder by using water at a temperature at a temperature of at least 70 degrees Celsius. "Some years back WHO, with the support from international experts, and in collaboration with relevant industry associations, prepared ‘Guidelines for the safe preparation, storage and handling of powdered infant formula’. The background was a concern that parents – and indeed even health personnel – might not be aware that powdered infant formula is not a sterile product. Therefore it may contain harmful bacteria, which is why the Guidelines state that water used for re-constitution should be no less that 70 degrees Celcius, resulting in a reasonable killing rate for bacteria present. 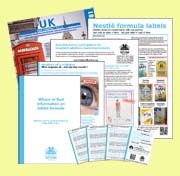 The WHO guidelines remain an important safeguard and all preparation of infant feeds from powdered infant formula should certainly follow them." "The marketing for BabyNes leads parents to assume that every safety precaution has been taken - lulling them into a false sense of security. Unless companies warn parents that the powder is not sterile there is a risk - increased by the expense of the capsules - that feeds will be kept for later use. Nestlé should redesign this machine as a matter of urgency and ensure that the water is added to the powder at 70 degrees Celsius as recommended by WHO. Despite repeated requests to Nestle, the company has failed to explain why it has chosen the least safe option for preventing harm from formula contamination. All their focus is placed on the water. This is a deliberate diversionary tactic." As well as ignoring UN safety recommendations, Nestle is also using idealising claims on its promotions and packaging, claiming that the product is "inspired by the model of breastmilk", that "month after month, its composition evolves naturally" and is encouraging parents to make direct contact with Nestlé employees at any time of the day or night. All these actions are in violation of the International Code of Marketing of Breastmilk Substitutes and subsequent relevant World Health Assembly Resolutions - which Nestle claims to espouse. Nestlé adds probiotic Bifidus bacteria to its products and uses these as the basis for marketing campaigns claiming, with little substantiation, that they provide health benefits. These are sensitive to heat. If the company introduced the step to kill any harmful bacteria in the formula in line public health recommendations, these probiotic bacteria would be destroyed, so undermining its marketing strategy. Nestlé cites the fact that Switzerland has not yet adopted the WHO Guidelines at national level. This does not prevent Nestlé taking the required action. Nor does it excuse Nestlé's strategy of gaining global publicity for the machine by launching it to the press in Switzerland. Baby Milk Action has repeatedly sought the assistance of the Swiss Government and the UN Global Compact Office to take action over Nestlé’s marketing strategies, invoking the OECD Guidelines for Multinational Enterprises and the UN Global Compact Principles under which companies should abide by the International Code of Marketing of Breastmilk Subsitutes and subsequent, relevant Resolutions of the World Health Assembly. Neither have taken action nor investigated the complaints, saying their aim is to ‘promote dialogue’ under the auspices of these totally voluntary measures. Health Professionals Letter on Enterobacter sakazakii Infections Associated With Use of Powdered (Dry) Infant Formulas in Neonatal Intensive Care Units, U. S. Food and Drug Administration, April 11 2002 Ref: Muytjens HL, Roelofs-Willemse H, Jaspar GHJ. Quality of powdered substitutes for breast milk with regard to members of the family Enterobacteriacae. J Clin Microbiol 1988;26:743-746. Nestlé is also marketing the capsules for use without the machine without warning users that the powdered formula is not sterile and to use water at 70°C at least.